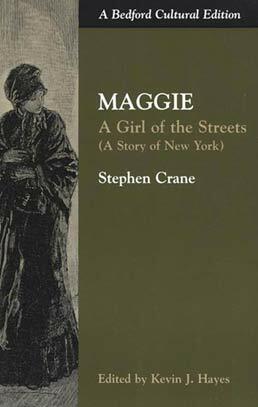 Merging together an annotated editon of Maggie with an array of documents, this version of Crane's text analyzes related topics such as tenement life; shops, saloons, and concert halls; working women; prostitution; realism; and slum fiction. Harry P. Mawson, "A Hot Wave Among the Poor"
Alice Wellington Rollins, "The New Uncle Tom's Cabin"
Alice Wellington Rollins, "The Tenement-House Problem"
James O.S. Huntington, "Tenement-House Morality"
Jacob A. Riis, "The Problem of the Children"
William T. Elsing, From "Life in New York Tenement-Houses"
Julian Ralph, From "The Bowery"
David Graham Phillips, "The Bowery at Night"
Stephen Crane, "Where 'De Gang' Hears the Band Play"
James D. McCabe, "The Beer Gardens"
George Frederic Parsons, From "The Saloon in Society"
Thomas Hood, "The Song of the Shirt"
Jacob A. Riis, "The Working Girls of New York"
Katherine Pearson Woods "Queens of the Shop, the Workroom and the Tenement"
Jane Cunningham Croly, "Senate Testimony from 'Jennie June' "
Abraham Hummel and William F. Howe, "Store Girls: Their Fascinations, Fobiles and Temptations"
Edgar Fawcett, "The Woes of the New York Working Girl"
"In Employment Offices: Trials of Women Who Look There for Work"
"Counter Trials: The Shop-Girl Speaks"
"The Song of the Shirt: How the Finisher Lives"
"The Embroiderer: Quick Work and Scanty Wages"
"The Black-Borderer: A Solemn Kind of Work"
Charles Loring Brace, "Street Girls"
U.S. Department of Labor, "Report on Prostitution and the Working Woman"
Helen Stuart Campbell, "The Case of Rose Haggerty"
Hamlin Garland, "The Future of Fiction"
Rupert Hughes, "The Justification of Slum Stories"
William Dean Howells, From "New York Low Life in Fiction"
J. W. Sullivan, "Minnie Kelse's Wedding"
Stephen Crane (November 1, 1871–June 5, 1900) was the author of The Red Badge of Courage and Maggie: A Girl of the Streets. He died in 1900 at the age of 28.